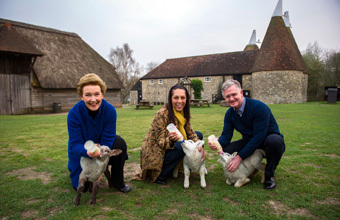 TOURISM minister Helen Grant launched the Kent Big Weekend and English Tourism Week during a visit to the Kent Life family attraction. Mrs Grant, MP for Maidstone and The Weald, met Amanda Cottrell, chairman of Visit Kent which organises the Kent Big Weekend, and John McDonald, director of the Family Holiday Association. Visit Kent received more than 115,000 applications for the 20,000 free Kent Big Weekend 2014 tickets to 123 top visitor attractions and destinations across the county. For the first time, the tourism champions worked with the Family Holiday Association, which supports families not usually able to enjoy a day out or short break, to join in the Kent Big Weekend fun at Kent Life, Rochester Castle, The Historic Dockyard Chatham, the Hop Farm near Paddock Wood, and Dover Castle. Chief executive of Visit Kent Sandra Matthews-Marsh said: "Kent Big Weekend 2014 has been the biggest and best ever - even the weather was tremendous. "We are particularly delighted that the Tourism Minister could join us to launch our major celebration of Kent's tourism, leisure and hospitality businesses which contribute more than £3.4b to the county economy each year."